Nope, this is not a post about reading water or discovering how to find fish when they are moving between water types. Instead, remember your second grade science lessons when you learned about the difference between water in its solid and liquid forms. The extended cold weather finally gave way to warmer temperatures. One of the great aspects of living in the mid-south is that we normally get a reprieve from the cold weather on occasion throughout the winter. This past weekend saw highs soaring into the low 60s, meaning that all the snow and ice we've experienced this winter has largely melted. Still, in sheltered gorges, large ice formations remain to remind us that the icy grip of winter is not far away. I hiked with a group of friends at Colditz Cove State Natural Area. This was my second time there, and I spent more time with the camera than compared to the previous trip. The water on the sides of the gorge was in a transitional stage. The ice was glistening as it softened up but without completely melting all the way. The late afternoon light was incredible as well, often combining with the natural elements of rock and ice to create beautiful compositions that I only feebly attempted to capture. This ice formation was almost shaped like a claw. The smooth texture was the result of the warm temperatures slowly melting the ice. The same ice formation contrasts nicely against the warm light on the roof of the overhanging rock. 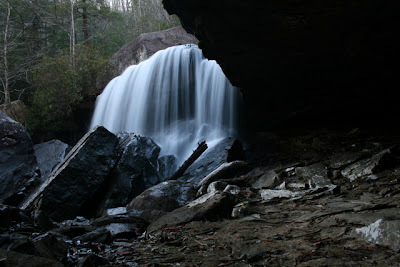 The centerpiece of the hike, Northrup Falls, plunges over 60 feet to a turqouise pool below. A lone plant clings to the moss covered wall of the gorge. This fallen tree provided the perfect base for an unusual ice accumulation. So is this what a squirrel sees when it climbs a tree? Curtains of ice glisten as they hang on the canyon walls. Winter has always been enjoyable to me, especially when there is plenty of snow. Tennessee winters are notorious for cold rain, but sometimes not much in the way of snow. This winter I have been reminded of the winters I experienced as a kid. Around here, 4"-6" snow is a big deal and we have had more than our share of those and even a few going a bit more. Those of you that live in mountainous areas out west or perhaps further north probably get tired of all the snow, but it is a nice change of pace for us here in the southeast. Over the past week or so, I've taken a lot of pictures including some of absolutely incredible sunsets as well as frozen waterfalls (or mostly frozen). The following are a few of my favorites. First Float of the Year: "Just In Time"
Sunday rolled around, and I woke up early, ready to hit the road for the Caney. Pulling into our take out point, I saw David P. with the drifter already there. I got my stuff switched over to his truck and off we went. As we put the boat in at the launch, we could see people catching a few, and fish were rising occasionally to something small in the surface film. I had a special spot I wanted to try, and David P. was kind enough to accomodate. This proved to be a great move as we got into several fish rather quickly including my first crappie of 2011, a few browns, and numerous skipjack. Finally, we realized that we needed to make some progress down river. Shortly after we started drifting, I hooked an energetic rainbow, but was thrilled to see a huge golden flash behind it as it twisted and turned on its way to the boat. Monster browns are always what we are after when throwing streamers and this fish would definitely have qualified. Unfortunately, I only got a quick glimpse of the fish before it vanished and it didn't reappear. 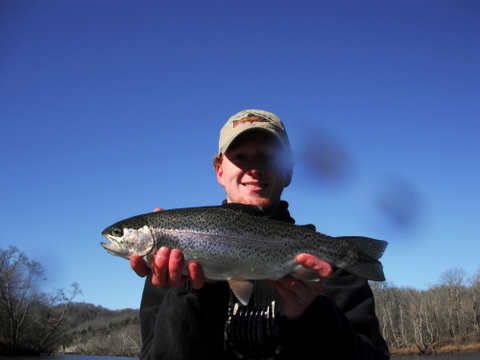 We moved on down the river, moving a a few fish and hooking up with some more nice rainbows. David P. had some new patterns he wanted to try when it was his turn to fish. His new streamer was the hot fly for the day. Even though I had the right color, his pattern still outfished mine for the most part. Over the course of the float, he managed the Caney Fork slam and some skipjack, while I only caught rainbows and browns plus skipjack and that one crappie. We were both surprised at the number and variety of fish that were chasing our streamers. A few big browns came out to chase our streamers, but we couldn't get any truly large fish to commit. As the shadows grew longer, the temperature started dropping to the point where we were getting ice in our guides. 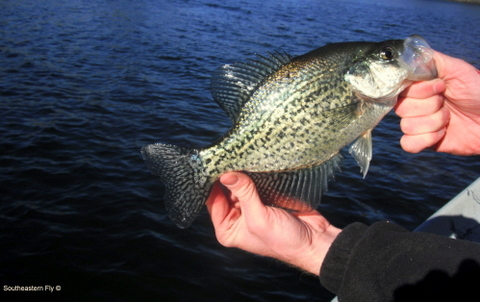 We became more interested in making it to the take out than slowing down and thoroughly fishing every spot. As we took the boat out, both of us agreed that it was one of the better days either of us have had in awhile.